They’ve been causing havoc and terrorising residents and toursists in Caernarfon. And these are just the few top stories on the matter! (If you Google “seagulls North Wales” you’d find a lot more including this list of attacks!). Whilst I can understand why people don’t like them, I will admit that I do! What I especially like is when they’re stamping their feet in on the floor to bring up worms. I really like watching them being terrors and to be fair, they are fun!! I’ll share a couple of our run ins with the ‘gulls! When I was a child, we used to go on day trips to Butlins in Pwllheli. The day would be spent in the pool (awesome pool! ), at the arcade, on the roller coaster and on the marine lake. I remember we had sat down by the lake to have our lunch which was a picnic of sandwiches, crisps and cake. 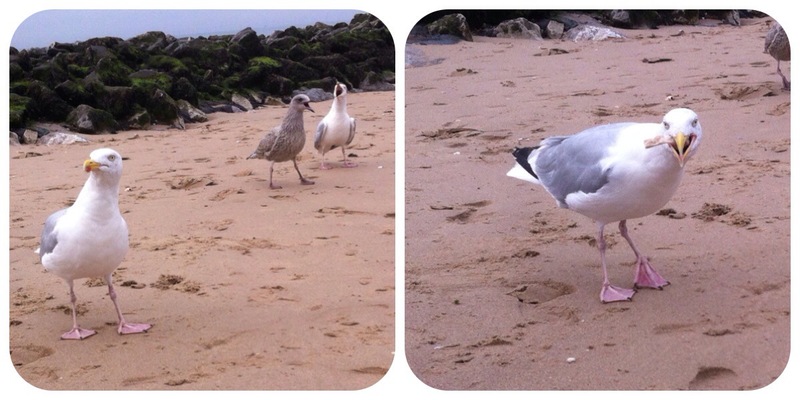 Taid was just tucking in to his sandwich when a seagull landed on his head to steal his sandwich! It was so funny! I just wish I had a photo of it! 2) They like sausage rolls too! They’re jot content with just sandwiches though! They’ll also steal your sausage roll! Hubby was walking around Llandudno one evening after work and managed to scrape just enough change to buy himself a sausage roll for supper when a seagull swooped in an stole it right from his hand! I wasn’t there to witness this one but still I found it funny! He didn’t of course! Yes they like McDonalds too! There’s always seagulls on the hunt by Llandudno’s McDonalds. I remember sitting in the carpark with Dad and we were watching one seagull hop from one car to the next. This particular seagull was strutting his stuff in top of one car when suddenly he fell through the open sunroof! It was one if the funniest rings I’ve seen! This seagull was stuck in the car flapping hi wings and making one hell of a mess! I feel for the car owner but you know what, that’s what you get if you leave your sunroof open!! What is your opinion on seagulls? Do you love them or hate them? I love them!! They live for up to 40 years, which I like. I love how wild they are, living their lives out on the cliffs and at sea, come wind or rain. Love them and what they represent to me.